find. TokenMarket streamlines the process of buying, exchanging, and researching tokens, creating a more strategic and unified place to enter this developing space, all through a secure and familiar interface. Hi Mikko, thanks for chatting with us! How did the idea for TokenMarket come about? 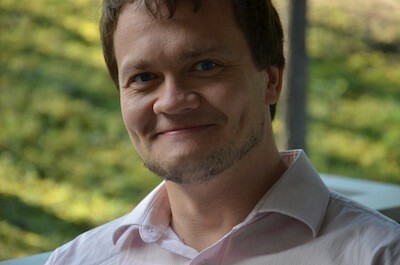 I’ve been friends with the CEO and Co-founder, Ransu Salovaara, for many years. We’ve been working on this idea for quite a while. Ransu has a background in old fashioned trading, bonds, stocks, stuff like that. We wanted to apply this new blockchain idea to regulated markets. We are still doing that, but as you know, regulation takes time to change. We do expect that in 3 to 4 years, the regulatory environment will have evolved to be highly supportive of token crowdsales. We were working on this idea of a token crowdsale marketplace, when late last year around November, we saw a crowdsale boom coming on the horizon, and decided to pivot our plans towards crowdsales. I am advising FirstBlood team and we did very well with that crowdsale. We started to get contacts from many people asking for help with their token crowdsales, and wanted to create something to help them. In December, since Ransu has a background in investment banking, and since I have a background in creating proper smart contracts, we teamed with Mr. Gavin Knight, who is managing our investor relations and knows many high stakes investors in the crypto space. Ransu began making phone calls, saying “We are launching TokenMarket, we want to support cryptotoken projects, do you need any help?” TokenMarket has grown from there. You mentioned being in touch with regulators, and eventually creating a blockchain for regulated markets. Which regulators have you been in touch with? We are headquartered in Gibraltar, so we’re working with regulators in European Union. They know what we’re doing, and they expect us to come up with good ideas on how this sort of market could work in the future, so that it’s safe and transparent for investors. Since you interact with a number of different projects at TokenMarket, you have a “bird’s eye view” of the blockchain industry as a whole. From what you’ve seen, what aspects of token crowdsales could be improved? Let me put it this way: I estimate that this year, there will be up to 300 blockchain crowdsales. Most of those teams, they go out too soon, before they have anything ready. They just think: “We’ll launch a crowdsale, and money will come in.” Many of the teams that approach us don’t have a CTO, or the team members may have some technical background but can’t write code. Since most of these crowdfunded projects are some sort of token, it’s best to have some sort of prototype or proof of concept to say you can actually do it before the crowdsales starts. At the same time, I’ve been scraping crowdsale data since last September, and I’ve seen most token crowdsales make 90% of their money on the first day — so it doesn’t make sense to me that so many teams focus their marketing efforts on what happens after their crowdsale has started. It’d be better to have a working prototype before the crowdsale starts. What resources or infrastructure do you think need to be in place in order for more people to participate in crowdsales? At the moment, the status of wallets for Ethereum is quite bad. For example, you can’t participate in crowdsales from cryptocurrency exchanges directly. That makes it more complicated for many people — friends and family who would like to participate in crowdsales but don’t have the technical know how. That’s going to get better with time, as Coinbase and Kraken work to support ERC20 tokens. Once that happens, participating in crowdsales will be much easier. We’re also working with vendors trying to link fiat currency directly to crowdsales. What excites you about the WeTrust project? As a business, or an industry, insurance is something that can and should be automated. The insurance industry end-to-end is purely math, so you could and should replace an insurance company with a smart contract. I see WeTrust bringing efficiency to a very old industry. That’s a great application for smart contracts. What kind of blockchain projects would you like to see in the future? I wanted to mention that right now all the crowdsale teams are building smart contracts and token contracts from scratch. There is some wasted effort in this, because all those crowdsale smart contracts look the same in the end. I’ve started working on a crowdsale smart contracts GitHub repository for standardized and modular crowdsale contracts, that comes with tests. I’m working with an auditor to go through it these days. Thanks for chatting with us Mikko, and for everything you’re doing for the community! Alex is the founder of ICO Countdown, one of the earliest Blockchain Crowdsale listing sites that spotlights high potential crypto projects with a focus on crowdfunding methodology, and conducts due diligence to ascertain the viability of those projects. Hi Alex, thanks for chatting with us! How did the idea of ICO Countdown come about? Well, I found a lot of due diligence was missing in the crypto space. I’ve been following the space for about 5 years. I was interested in alternative cryptocurrencies, and at the time the only discussion was on Bitcointalk. After 5 years of due diligence, there was a boom in crypto projects in 2013, and I followed it through into creating ICO countdown. It felt like the right time, and I felt I had enough experience. A lot of people had missed out on the Ethereum crowdfund, and other popular crowdfunds, so I created a website with the aim to give people the best data and information. I wanted to perform due diligence on these projects and improve the community, remove projects that are damaging to the community. Back in 2013, many different thing were happening. There was a bull run. People weren’t doing the best due diligence. ICOCountdown was a reaction to that. Another principle we were founded on, is we want to show off new technologies which myself and others believe could impact the world in the future. Many of these projects are not getting a lot of exposure, and providing them with exposure is another important aspect of the site. Do you have a background in conducting due diligence on crowdfunded projects? I’ve been in due diligence a long time, with my main background in cyber security, and a lot of the same skills translate to the crypto world. It requires a good technical understanding, since you can’t do the typical SWOT analysis [Ed. note: SWOT stands for Strengths Weaknesses Opportunities Threats, is a common framework for analyzing business organizations]. Back in the early days, I was just trying to express basic ideas, like why is the blockchain used, why is decentralization important. In the 5 year window since, I’ve analyzed many projects. I really believe in the technology, but new people didn’t know as much. I wanted to create a very simple site, so that people coming into this space could feel there was somebody on their side. A lot of times, people are trying to push an angle, saying “This is a good crypto project”, without giving good analysis. I wanted to make sure the right projects, such asWeTrust, could be represented — these projects need a chance, and deserve a chance. In addition to cybersecurity, what do you feel must be understood when performing due diligence on cryptoprojects? There has to be a core understanding of the fundamental technology, as blockchain stuff is very focused on consensus networks and algorithms. There needs to be an understanding of why the bitcoin algorithm works, why it’s stress tested, why it doesn’t have collisions, and valid use cases. In the other realm, for general crypto projects, there needs to be an understanding of the project’s general volition in the world, of what the project team is trying to achieve and aim for. Different things, ranging from the political, and the social, to the environmental, all feed into decentralized technology. You have to examine all of those factors. 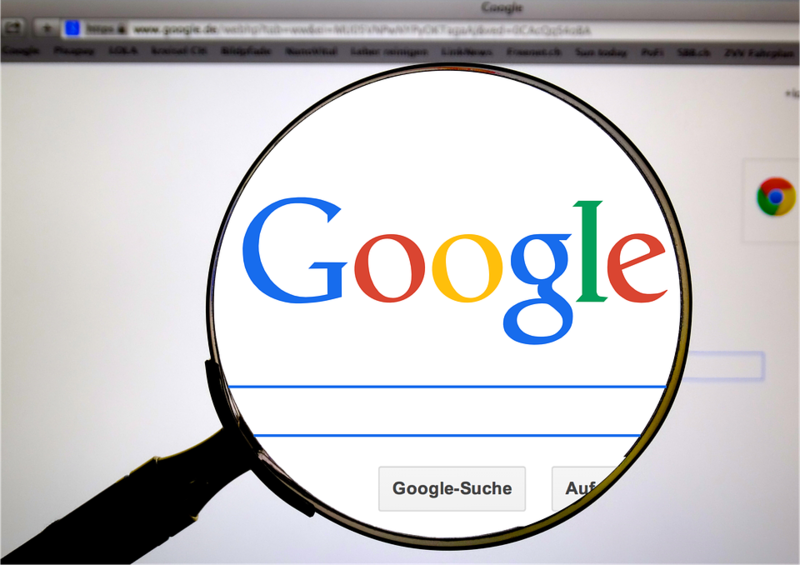 From one second to another second, new information could appear, and could fundamentally change the status of a company or project, and my job is all about being ahead of the pack with that information. Since you interact with a number of different projects at ICO Countdown, you have a “bird’s eye view” of the blockchain industry as a whole. From what you’ve seen, what aspects of token crowdsales could be improved? My personal ideology is there needs to be more prototypes, more early alpha releases, so that people can get their hands on the tech before crowdsale release. The ideas behind these crypto projects are brilliant, and the crypto space is not small. Quite a few people are working on many different projects. With more people, particularly from Silicon Valley, coming in and having a crack at it, including ex-Google engineers, that’s been really cool. If we could bring old school peer to peer tech guys back into the mix, that would be really cool. In general, I think crowdsales are improving, there’s more capital inflow, and teams are stepping forward a lot more to deliver. But more validity of the software and more proof of concepts would be great. You’re clearly very passionate about the crypto space! Which projects are the most exciting to you? All of the projects! Everyone in the space is doing a great job. There’s been a general increase in tech development, capital injection, and a definite increase in more and more people in the space who want to develop and create. I believe in being inclusive in this space, to stimulate the best tech development we can. There’s a great sentiment moving forward, and I hope it perpetually moves forward. What excites you most about the WeTrust project? I really like the team, and like the steady tech development that has happened before the crowdsale. The project holds a lot of synergy with the whole decentralization movement. The guys seem very technically capable, and on their hustle, and I definitely respect that. It doesn’t harm anything coming fromSilicon Valley, having experience in those markets. The team has good ideas, are taking the project very seriously, and are very passionate — and passion is an important part of what I look for. Definitely cybersecurity related projects. Crypto projects work on a basis of cyber security, so it would be great to see more projects focus on securing users, making users less susceptible to things like malware and DDOS. That would help users get involved in the blockchain movement. Aside from that, I’m a fan of minimalism and simplicity — a project doesn’t have to be complicated to win. 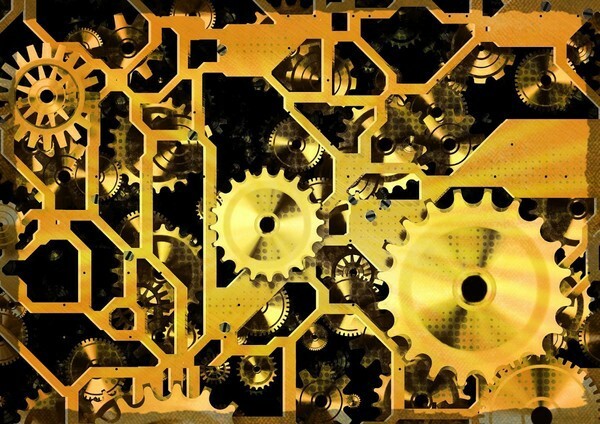 More engineering products could be cool, like more AI project — though those tend to be very complicated. I try to put a general focus on people coming up with new and exciting ideas. Some of these ideas or very different, or very weird — but I like the weird ideas that are abstract, with a lot of content. The sort of thing that’s strange at first, but then you think “They have something here!” In any sector, many people can come up with great and interesting ideas, and I want to see more and more ideas in the blockchain market, along with more development. There’s a lot of talk about insurance, which I know WeTrust is looking at, and is a really complicated and interesting problem, since it’s an industry that really hasn’t developed for many years. Thanks for the kind words and for chatting with us Alex. This post explains the steps required for retrieving your Trustcoin from the WeTrust crowdsale, it is relevant to anyone who contributed to the crowdsale, or participated in any of our bounty campaigns. To receive your Trustcoin you need a wallet that supports ERC20 tokens (accounts in Coinbase, Poloniex, and Kraken, for example, will *not* work for this, and your tokens will likely get “stuck” there). 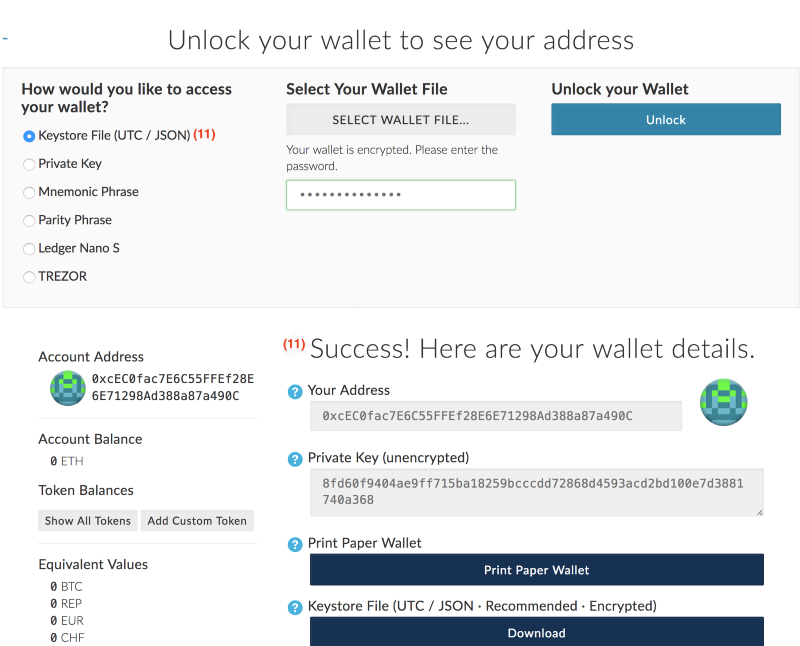 If you’re not familiar with wallets, you probably want to read up on how to store cryptocoins in a safe, secure and backed-up way. This is not the usual yada yada; we cannot stress enough how keeping up with best practices will reduce the actual risk of losing your funds. Therefore please do a thorough research on this subject before choosing a wallet. While WeTrust cannot endorse any third-party wallet vendor, two popular ones are Ethereum’s official wallet Mist, that you can download from the official site, and MyEtherWallet which is one of the quickest to set up. You might want to search for other ERC20 compliant wallets, but remember to perform careful research as WeTrust simply has no control over, and cannot be responsible for the tokens once you receive them. For additional questions, feel free to join our slack channel and find out how other advanced users are choosing to store their Trustcoin. How do I enter my Receiving Address? To enter your Trustcoin token address to which the tokens will be sent (which is essentially an Ethereum address), go tohttps://wetrust.io/tlc/crowdsale. 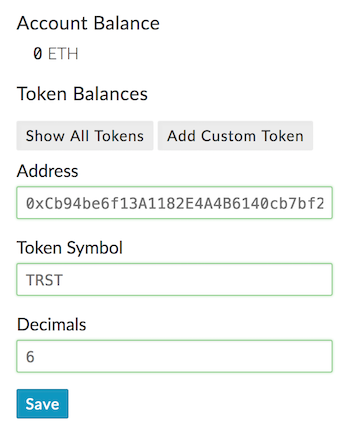 After logging in, you will be able to see a new input on your dashboard, called ‘Intended Token Address’. Enter the address of your ERC20 compliant Ethereum wallet here, and click ‘Save Changes’. You’ll receive a notification on the site if your save was successful. You can change the address as often as you like, but we will only send to the address you have saved at the time of distribution, so please ensure it is correct at all times. Enable 2 factor authentication (click “2FA” on the upper right corner after logging in). This will make sure that even if someone were to get their hands on your password, they will not be able to log in to your account. Logging in will then require a one-time code generated by your physical phone on top of the password. In the meantime, we request that you enter the receiving address to which your Trustcoin will be sent, as soon as possible. We also recommend enabling Two-Factor Authentication (2FA). Learn more about adding your receiving address and 2FA in our blog post. Bounty participants, please see special instructions at the bottom of this message. Collect participants’ Ethereum addresses starting today. Once the crowdsale ends, give participants another 48 to 72 hours to enter the receiving addresses and make sure their final TRST amounts, displayed on the dashboard, are correct. Fix any issues raised, and run a few more tests and validations, to make sure the TRST amounts are correct and that the distribution process will execute as planned. Freeze any changes of the receiving addresses for the last 12 hours or so before the first distribution takes place (to prevent malicious activity). Deploy the TRST token contract (the source code of which you can seehere) and transfer TRST to all participants that have entered their email address and provided their receiving address. Publicly announce the final mainnet contract address. Receive a final confirmation from escrows before the crowdsale funds are released to WeTrust. Continue to follow up with crowdsale participants who did not provide a receiving address in time for the first distribution. Work really hard on improving financial inclusion! To get updates on this plan, please follow us at our Slack channel. If you don’t manage to enter your receiving address before our initial distribution process begins, don’t worry. We’ll be performing a few rounds of mainnet distributions in the next few weeks to make sure that as many people as possible get their Trustcoins. Please register athttps://www.wetrust.io/tlc/crowdsaleusing the same email you provided when registering for the bounty campaign, and provide your receiving address. 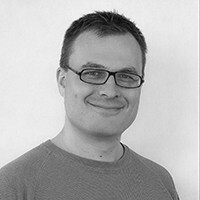 Julian Zawistowki is the Founder and CEO of Golem, a global, open sourced, decentralized supercomputer that anyone can access. It will be made up of the combined power of user’s machines, from personal laptops to entire datacenters. The Golem Network is a decentralized sharing economy of computing power, where anyone can make money ‘renting’ out their computing power or developing and selling software. Hi Julian, thanks for chatting with us! Could you tell us a bit about yourself, and about how Golem got started? I’m originally an economist by trade, and entered the blockchain space quite late in 2013. We came across Ethereum in late 2013, which was in its infancy at the time, of course. As a result, we became involved in the development of Ethereum. I’ve been a long term fan of decentralized systems, both in computing and in other areas. Once we digested what Ethereum is, we came to the conclusion that we could build something like Golem on top of Ethereum. The idea for Golem had actually been with us since February 2014 and was first presented during DevCon in November 2014. Development on Golem started in 2014, and in 2015 we really started to ramp up. We had more runway and resources then and being focused became very important. After DevCon1, we thought it was reasonable to develop Golem further, after seeing Ethereum become more mature. What do you think about the current situation of the blockchain space? Well, the recent growth in many coins prices is of course very nice but it is a double edged sword. The fact that this technology has coins gives us a great opportunity to finance development and that’s great, but that also distracts some people from the core thing, which is technology, and not speculation. I believe Ethereum is an incredibly promising technology, with a lot of potential, but still in development. Therefore I believe we should — as an industry — focus on development of technology and not get too excited about markets. I very like the policy of not having any trading discussions on the Ethereum sub-reddit. How will Golem be more versatile than a distributed computer like FoldingCoin or similar projects? One important difference is that unlike FoldingCoin, we do not generate coins in the process of computing. In a traditional proof of work system, you get coins that are magically created as a reward for solving a hash puzzle. We aren’t creating new coins for doing the work, we just facilitate contracts between requestors, someone who needs a job done, and providers, someone who has a computer to do the computing, and it’s a simple transaction between them. And that’s it — and I think that gives great flexibility. It means every requestor is fueling the network with tokens, and the provider can eventually sell the tokens, which is an economy that can work. If you generate tokens for solving something, like in traditional proof of work, it can be very cool, but there’s no reason for that token to have any intrinsic value. Bitcoin has intrinsic value only because people believe it has value. With Ethereum, it has intrinsic value when it’s used as gas. In our case, we have abstracted the token itself from the part of doing work, and what’s left is the protocol, which is our token, and which draws economic interactions between the nodes. That’s important to understanding why we’re different from other systems. I’m curious how you came up with the name for the Golem stages — is it inspired by the Blizzard video game Diablo? Originally, we got the name Golem from science fiction writer Stanislaw Lem’s novel Golem XIV, about a military supercomputer that achieved singularity and became like a super artificial intelligence. I believe the writer named the supercomputer Golem after the Jewish myth of the artificial creation resembling man. That book is the reason we named our project Golem. How do you think people working with blockchain can drive greater acceptance of cryptocurrencies among the “general public”, people who aren’t intimately familiar with blockchain technology? I think the key is to focus on properties of the blockchain. The blockchain comes with certain features that are good, and certain features that are not that good. For example, losing your private key is not that good. For greater adoption we have to take full advantage of good features and find ways to minimize hurdles, immersing technology in great UX. I believe once we have great UX and people learn about the properties of blockchain technology, then adoption will happen, because blockchain can create systems that are simply better than what we have at the moment. I think financial institutions will use blockchain, but I don’t think that’s where the most important things will happen from the perspective of public chains. If they do something blockchain related, it will be closed technology, run by a tight circle of institutions working together. Still, for identity management, contracts, any situation in which people interact with each other and many more, you can use smart contracts and decentralized systems and you can and should use blockchain technologies. The barrier to greater adoption is just in making it simpler to use, so it can be immersed into people’s lives. Right now, this is definitely something we have a problem with, as an industry. Also, one of the problems facing every application that has its own tokens, is creating a way to simply acquire those tokens. Simply getting dApp tokens is still a pain, and we cannot expect the average user to do that. So we have to make that better. I foresee major progress in this area in the next few quarters. What do you know about WeTrust? How did you learn about WeTrust? What excites you about the project? I don’t know much about WeTrust, but I have seen news about you on Reddit and visited your website. I have to say, I very much like the idea, it’s very personable, and can benefit developing countries. I’m very interested in the fact that this is using high technology, aimed at the low end part of the developing market — I think that gap can be closed with this technology. At the end of the day, it seems you will be making it simpler for this community lending to happen. Thanks for chatting with us, Julian! By popular demand, we have compiled a follow up containing some commentary and stories about our community of enthusiastic and passionate supporters who believe in using the blockchain to improve financial inclusion. We really appreciate the great responses from WeTrust community members Ben aka “Jesse Livermore”, Shahyan Ahmad, andGriff Green. If you want to participate in our community, join our Slack or ourongoing crowd sale. We welcome and look forward to any questions, constructive comments, and debate regarding our project. In fact, our discussions with members of our community often lead us to ideas for improving our product. Join us in using blockchain to create a new financial system that’s For the People, By the People. The questions and very thoughtful responses are shown below. 1. Tell us a bit about yourself — as much/ little as you’d like to share. My real name is Ben. I live in Colorado, born and raised. I grew up watching my grandma play the futures market and was always intrigued by CNBC and my grandma always charting Pork Belly futures. 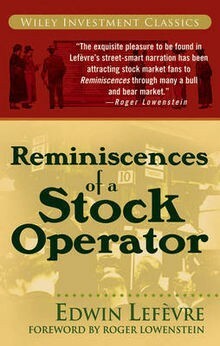 I opened my first stock brokerage account when I was 15, read every single stock book I could (starting with “Reminiscences of a Stock Operator” about Jesse Livermore, who has been the most amazing boom-bust-boom-bust stock speculator ever written about), and I also quickly learned that stock message boards are useless but very persuasive to novices who are looking for direction. Somehow though, I got lucky with this first account and turned $500 into $15,000 (internet bubble) and then quickly saw it deflate to just a couple thousand, post-bubble. Nonetheless, I was hooked. I daytraded throughout highschool, graduated and then took a year off to daytrade some more. Only problem was I had no investment strategy with sound backtesting or fundamentals. It was just me and my feels for that moment, trading on a whim. I created numerous stock-trading systems and even ran an investment newsletter for subscribers which at one point had over 100 paying subscriptions (all of like $10/month, though). Anyhow, that was not sustainable and eventually I lost all my money daytrading and quickly gave up the newsletter biz and went to college. At college I was on the Finance degree path, learned about FOREX and started to daytrade FOREX while in college. Again though, no backtesting was done on my strategy, however I at least had a strategy this time based on Elliott Waves. FOREX, however, is incredibly emotional, as well as being manipulated by many many parties out there, one of which was my own FOREX broker who I quickly learned was making money by taking the opposite side of trades. With leverage of 200:1 I was almost always getting margin called and quickly lost a couple hundred dollars. Some might say that that money, as well as the daytrading money I had lost post-high school, might have been better spent on college tuition; however I am of the opinion that losing that money the hard way was my tuition for learning the investment world. Nothing will teach you to keep your emotions in check and learn from your mistakes better than losing everything you have in the investment world due to mistakes of your own making. From there I got my Finance degree, worked for a small Registered Investment Advisor (RIA) as an Analyst and eventually Portfolio Manager. I was in charge of all due diligence of potential funds (mutual funds, ETF’s, hedge funds and other actively-managed investment firms) and quickly learned how to spot red flags. In early-2007 I kept the firm from buying some very toxic debt being sold by a consortiumof investment banks from Wall Street and in 2008 I started managing portfolios and somehow made clients money via trading their tax-free annuities, fee-free, during that horrific downturn. Overall the clients I managed in my strategy made +10% in 2008 while everyone else around the world was down -30% on average, and yet my clients had no idea that they were in the rare minority of clientele anywhere who actually MADE money. Not a single ‘thank you’, ‘good job’, ‘you are amazing’ or even a thumbs-up. They were utterly clueless that they had just dodged a huge bullet. I quickly learned that average Joe’s in the investment world really have no idea how the sausage is made, nor do they really care. A lot of them are thinking so long-term in fact that they’ll just be happy if you don’t end up being Bernie Madoff. The few who are short-term watchers though, they’ll question every move you make for them, especially the losses, and completely miss the fact that they’ve been beating the risk-weighted return of the S&P500 for the past 5 years. So I left that firm, thinking that maybe it was just those clients, and I joined a hedge fund instead (which happened to be one of the largest fund-of-fund and actively-managed hedge funds in Colorado) as a Portfolio Manager. In that role I was solely an active investment strategy creator and due diligence manager. I researched every imaginable strategy out there, perused academic finance/investment journals, backtested literally thousands of strategies. I also interviewed hundreds of active portfolio managers, found out how they claimed they made their sausage and then back tested their strategies. In the meantime I created the most amazing investment strategy which would have beat Warren Buffett over the past 60 years without any kind of killer, bear market-matching drawdown. And, more importantly, it was a simple strategy which wasn’t data-mined or fine-tuned to the past. It truly was tuning into some kind of constant in human nature which made it truly robust. With this strategy in hand I quickly found over $200 million of the firm’s funds following this strategy. It performed well, even with Bernanke’s QE 1, 2 and 3’s trying to throw the markets off. Overall though it was incredibly enlightening to see how any returns from this strategy really didn’t matter all that much. The investment world is all about sales and perception. There’s more of an incentive to bring in more funds via salespeople getting more client money than to actually earn funds via investment returns for clients. That was the lesson I learned quickly, and I would never go to the sales side of the business. So I got burnt out and left the industry completely and am now in aviation, another passion of mine since childhood. I still manage my own retirement funds and my family’s retirement funds using my ‘amazing investment strategy’, which I have memorized and coded into numerous spreadsheets. 2. How have you been involved with the blockchain community so far? What projects have you participated in? How did you get into blockchain space initially and what keeps you interested? During the time that Bernanke started his QE experiments I started hearing about bitcoin (I believe it was trading around $7). I was not technically adept though, so I couldn’t understand how mining worked and didn’t trust Mt. Gox, so I never bought in; however I was incredibly intrigued. Not being technically adept I didn’t think I could even learn it, which was obviously a huge mistake. When Coinbase came along and after bitcoin hit $1,000 I finally pulled the trigger on 1 BTC at like $600. I was so disappointed that I didn’t take the time to actually research and learn bitcoin that I decided I would never let that happen to me again in the crypto-world. Everything that seemed complex I would research and learn at least from an investment angle. Using Bitcointalk (where I was ‘Jesse Livermore’) I quickly discovered the alt-coin world and via chart-reading and research I bought into Doge, then Mint, then Black, then Dark and quickly amassed a couple of BTC-worth for my portfolio. I even ran a hedge fund with ‘Jesse Livermore Tokens’ using Counterparty for a short bit and earned ‘investors’ like 15% in a single week before returning everything back to ‘investors’ out of fears that what I was doing probably wasn’t legal. I built up a posse of friendships on bitcointalk and started sharing knowledge. Eventually I had barely enough Dash to start a masternode and learned how to code it using a VPN by myself. Around that time Ethereum’s crowdsale commenced. I had to choose between keeping my Dash masternode or switching to Ethereum. There was a barrage of FUD every day with regards to Ethereum and Vitalik. It was truly reprehensible and at the end of the day, that pretty much kept me from buying-in. Many months later, and much much much more researching on my behalf later, Ethereum’s genesis went live and I watched ETH drop and I quickly pounced with everything I had. I traded my ETH during the price increase and had many well-timed trades on the ensuing crash and successfully navigated the DAO and ETC fiasco. I’ve participated in crowdsales for: Augur, Digix, DAO, Singular, Melonport, Mysterium, Etherisc, Aeternity, Matchpool and WeTrust and although I missed out on Maker’s initial crowdsale I’m in that as well. I’m basically now at the point that unless there’s any major red flags I’m going to buy a ‘token’ amount of most crowdsales to help development of crypto and Ethereum. I tried to participate in Firstblood but, like many, had transactions rejected. I have plans to participate in Cosmos, Gnosis, Tezos, 0x, Akasha (hopefully), Colony (hopefully), Mysterium again, Swarm (hopefully) and Polkadot and as soon as DFINITY hits exchanges I’m jumping all over that. New niches, new verticals, new ideas and innovative projects basically keep me interested in crypto. At the core of it I love that I can directly help a project achieve success. That’s something the Wall Street investment world has strayed far far far away from. People no longer buy stocks because they want to help the company, they buy stocks so they can maybe retire with more money. 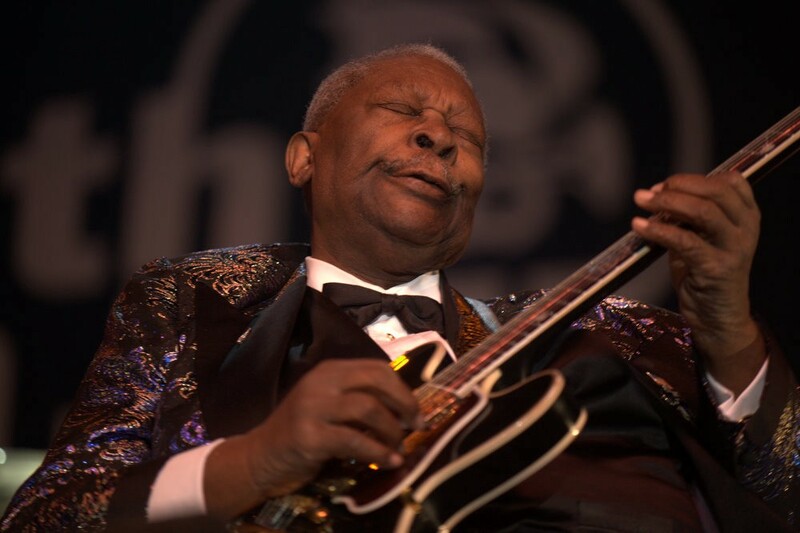 “The thrill is gone”, B B King said. That’s quite true for Wall Street and me. 3. What are your thoughts on the current state of the blockchain space? Which projects do you find particularly exciting? I think Bitcoin has quite possibly seen it’s all-time price peaks unless “something” changes, I think those saying “…but bitcoin has been declared dead 126 times now” are destined to go down with the Titanic. I think it’ll be a matter of time before the blockchain world gets revitalized by the inventiveness that Ethereum has behind it and/or is causing in other parts of crypto-land (ie Tezos, Cosmos, etc). Augur and Maker are probably the 2 most-exciting projects for me though. One can topple the betting world while the other can throw a huge monkey-wrench into the existing banking and stable currency world. 4. What are the biggest issues on your mind in regards to blockchain technology, crowdsales, etc… Where do you see this space evolving in the next 1–3 years? Matchpool’s drama (and Synereo’s before that) is showing how important transparency is or should be. I think the space will evolve into possibly seeing much more picky investors who demand Dev’s whom they know and trust and can show a history of a team that works together and actually likes each other. 5. What are your thoughts in regards to the WeTrust project? How do you think WeTrust ROSCAs/ Trusted Lending Circles could be used in your community, and by those you know? Which communities or audiences do you think can benefit the most from products such as WeTrust Lending Circles, and future Credit Identity products? WeTrust is exactly what I just referred to in that the team genuinely seems to like to work together, and the website and ROSCA concept is running smoothly and is opening the community’s eyes to this new, innovative vertical. I could easily imagine setting up a ROSCA amongst some friends/family to help with education/medical/other expenses. I think the student loan bubble we are in currently is creating an excellent niche for ROSCA’s and it might not even be the academic student who benefits most, but perhaps a trade school-attending student who sees huge benefits from ROSCA’s. Someone who might not have the typical path for loans available for them to get an education/training seems to be well-suited to using ROSCA’s. 6. What are your favorite articles fromour blog, and what would you like to see us write about in the future? Your “Disrupting payday loans” blogs are excellent use-case examples. I think the interviews of community members are going to be my favorite feature though, just because it will provide the crypto world an opportunity to learn about a member of their crypto-land as well as get another take on WeTrust from them. 7. Anything else you want to tell our readers? Honestly, I’m as excited about crypto as you all probably are. If you already aren’t a member of Jake Brukhman’s CoinFund Slack (coinfund.io) you are doing yourself a disservice and missing out on a ton of good resources and research. Overall crypto has always been about the community, from when Satoshi first pitched his ideas to the cypherpunk mailing list, to the insanity and always-prevalent jubilant posters on bitcointalk’s Announcement threads and to the sub-reddit communities. To be able to watch this crypto-movement now unfold into the public-facing world, which truly doesn’t realize how hugely in need of crypto’s benefits it is to further human civilization. This must be similar to what Jesse Livermore watched unfold as the stock market world started to spread across the U.S. and he was essentially a kid in a candy store. 1. How have you been involved with the blockchain community so far? What projects have you participated in? My involvement with the blockchain community so far has been superficial. I’ve read a lot of articles and watched some YouTube videos on how blockchain works. I’m fairly familiar (as a non-technical person at least) with how bitcoin uses the blockchain principle and infrastructure, but don’t yet understand how blockchain can apply to other industries. I’d like to get more involved, but participating in WeTrust’s crowdsale was the only bitcoin/blockchain activity I’ve undertaken so far. 2. What excites you the most about the WeTrust project? I’m excited about the WeTrust project because it has huge potential to disrupt the banking and loan industry. Low cost trust circles can make capital available to those who need it for a fraction of today’s cost with full transparency and record keeping. This will be very powerful for counties in the developing world especially (assuming appropriate access to infrastructure can be arranged). WeTrust is also a harbinger for further blockchain applications in other industries, making it a real pioneer in this innovative space. 3. How do you think WeTrust ROSCAs could be used in your community, and by those you know? Which communities or audiences do you think can benefit the most from products such as WeTrust Lending Circles? These types of circles have existed in Pakistani culture for a long time. They’re typically called “committees” (Express Tribune, Bloomberg). I can see the technology aspect being used to increase the transparency of the process, ensuring that everyone pays their fair share and also receives their disbursements on time. It may also enable people to expand their circles beyond those who they have deep trust with. 4. What are your favorite articles fromour blog, and what would you like to see us write about in the future? Hadn’t really looked at the blog till just now. I liked the article about “Using the Lending Circle as a framework for hosting social events and investing.”That’s a terrible title! But the content was easy to relate to. I’d like to see more structure to the blog, and tagging of articles for beginners, experts, engineers, investors and so on. It’s still too much of a black box for someone non-technical. 5. Any other feedback for the team? Feedback for the team (no filter): I’m a little frustrated every time I visit your website. This is a great concept and potentially hugely empowering for a significant portion of the world’s population, but the concept and its application are presented in a very haphazard, inaccessible way. You need to walk people through each step of how WeTrust works, starting with how blockchain functions. There should also be a section for newbies with a detailed glossary and links for further reading. There is a huge opportunity here if you can educate your customer base effectively. As an outsider, it looks like you’re missing it. I was the Community Organizer for The DAO and Slock.it and am currently running Giveth.io, a DApp for decentralizing charity to enable 100% transparency and at least the option for accountability :-D I also have a Masters in Digital Currency and give talks at conferences and blah blah blah. 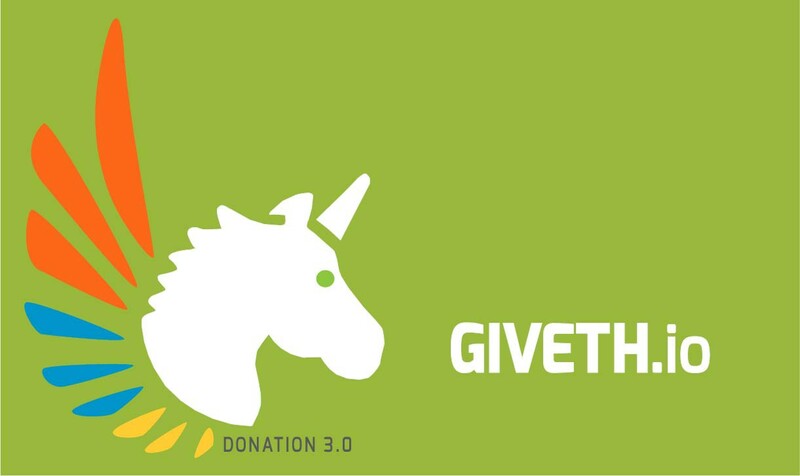 Giveth would prefer to build result based incentive structures for charitable causes. As in, let’s say someone wants to build a food bank, they may have bills they have to pay, well I would like my system to reward people after they complete the task (and maybe even pay them $400 even though their bills were $350), but then they still need to be able to pay their rent in the first place, and maybe something unexpected happens(they get robbed or can’t pay their bills for some reason) if they had a ROSCA with other similar food bank organizations in Giveth then they would be able to mitigate these risks. I see it as basically community insurance :-)! I want to empower donors to be able to trust that their money is being used effectively (and transparently) but I also want to make sure the change makers can succeed despite unforeseen events, and I think WeTrust’s ROSCA system can bridge this gap. Before we start: the following are instructions on how to use MyEtherWallet (“MEW”) to create a private address for receiving TRST tokens. Note however: MEW is one choice for using a wallet, there are many others out there. It is the user’s responsibility to perform the required research and choose the best ERC20-compliant wallet for them. WeTrust does not have the resources to verify the security and functionality of the third-party MEW application and cannot take any responsibility for damages caused by using it. THIS IS NOT THE USUAL YADA YADA: during this process you’ll be creating private keys for your wallet. We cannot stress enough the importance of these — if you lose them, you lose access to your tokens. If someone else gains access to them, they will gain complete access to your tokens. There is simply no recourse for both scenarios. Therefore, it’s important that you generate those from a machine you trust not to have malware, and you back them up in a safe & secure place. Instructions You want to be in a private place where no one is watching and there are no cameras filming you when you create a wallet. To begin wallet set up, please visit: https://www.myetherwallet.com/. When using this site, always make sure the address is exactly as it appears above, and that the green lock icon appears in your web browser. Along the top header, please go to the “Generate Wallet”(1) page. Enter a strong password. (2) If you think you may forget it, save it somewhere safe. You will need this password to send transactions. Click “Generate Wallet”. Your wallet has now been generated. Please download the Keystore file and keep it in a safe place. This file along with your strong password entered in (3) will be required to send transactions. REMEMBER: MyEtherWallet.com is not a web wallet & does not store or transmit this secret information at any time. If you do not save your wallet file and password, there is simply no way to recover them. Save your wallet file now and back it up in a second location (not on your computer). Yes, you want to do this later but you’ll forget to do this later. Please do it NOW. Congratulations! You’ve set up your wallet. WeTrust will need your public address (see above #7) to send you your Trustcoins (TRST). Please enter this entire value into the ‘Receiving Address’ space on your WeTrust Dashboard. You might have understood it by now, but please — DO NOT SHARE YOUR PRIVATE KEY WITH ANYONE, including WeTrust reps.
You may also choose to enter your private key and this will also unlock your wallet. (10). Upon entering the correct corresponding password to the Keystore File or Private Key for your account, your wallet details will be shown. (11) All your sensitive data will be shown here, so make sure you keep it really safe! 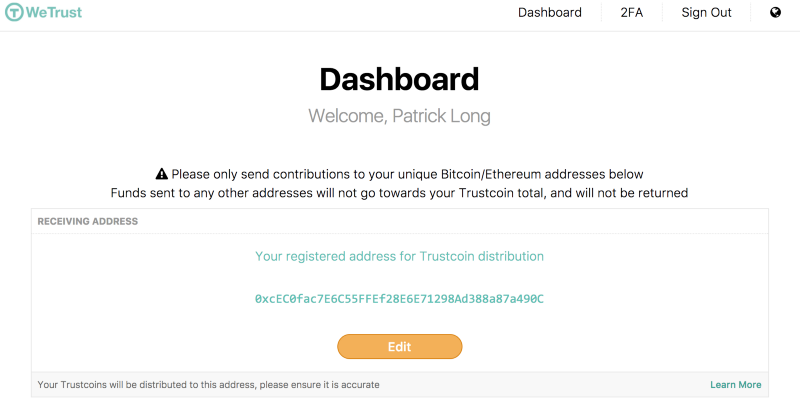 This step is important so that you can prove to yourself you can access your Trustcoins (TRST) and that you fully control your address. If you have any questions, please visit our Slack — we, and other advanced users in the community, are happy to answer any questions you may have. We set out a while ago to build a token contract for TRST, WeTrust’s app token. Though it is 2017 and one might expect that this would be a pretty straightforward exercise, it turned out there was enough maneuvering room left for the team to make development of the token contract interesting and fun. We defined our most important requirements to be 1) that the contract conforms to the ERC20 standard, 2) that we make its code as simple as possible, 3) that the contract itself be upgradable because, well, knowing exactly what the future holds is not a big part of our skillset, and last but certainly not least 4) that the contract be secure. ERC20 is a standard that allows wallet providers to easily manage tokens — allowing them to be transferred between users, and approving their transfer by other users (this is mostly used to transfer money to contracts). This sounds pretty straightforward but it turns out there is more than one flavor of ERC20. As an example, some implementations throw when an action (e.g. transfer) is unsuccessful, whereas others simply return false. Being the standards geeks that we are, we read the standard to the letter to decide on the best course of action. Our thinking about this is that callers of this function would likely expect it to return false, not throw, in the case of failure, as otherwise there’s no meaning to the return value — and yes, we have a valid underlying assumption that the ERC20 authors are smart chaps. Note that the ERC20 webpage has a lively conversation on the throw vs. return issue, but so far it seems the “return” option remains intact. We all know the heavy penalties that may arise due to bugs in contracts. While some contracts represent pretty complex business logic, and this complexity must be manifested in the code (e.g. our Trusted Lending Circle contract), others, like token contracts, can maintain their simplicity without losing any essential functionality. As much as we love great ideas (like Giveth’s MiniMe clonable token), we preferred to keep our creativity to our (mutable) frontend, while our (immutable) contracts should simply get the job done while reducing the attack surface and the likelihood of any unforeseen bugs. Simplicity is truly what we aspire to. However, we understood that while this contract should remain viable for years to come, the ERC20 standard and the users’ expectations may change over such long periods of time. Therefore, we decided that an upgrade mechanism has to be added to the contract. In a domain that aspires to generate trust between strangers like the Ethereum ecosystem, we thought it would set a good example to make sure that contract deployers like ourselves be restricted from doing anything that might hurt users even in the long term. In the case of Token Contract upgrades, one can think of a scenario in which the contract deployer is malicious. Suppose the deployer decides down the road to implement a malicious 2nd-generation token contract that hurts the users in one way or another — in the extreme case it would allow the deployer to “steal” tokens from other users, but a more moderate example would be generating an emission policy that many users may object to. Therefore the first constraint we wanted to add is an opt-in upgrade. The TRST Token contract will not force users to migrate to any new version, so our users will always be able to remain protected using the older contract. Here we arrive at a twist in the plot. Originally we were planning to describe the fancy migration mechanism we planned and implemented. It implemented an OutgoingMigration interface and required the future contract to implement an IncomingMigration one. It also protected the users with a minimum migration period. 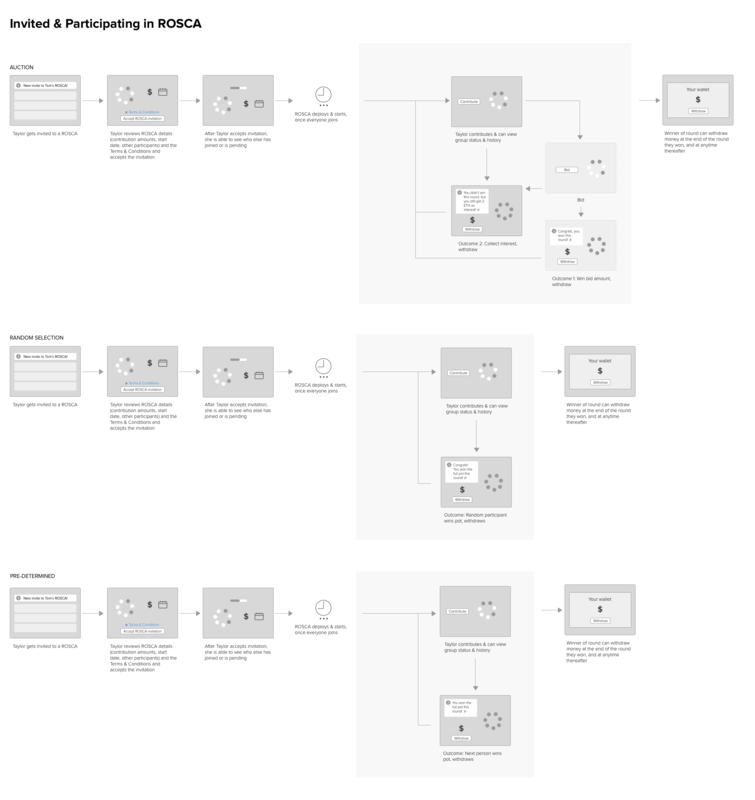 It really *was* fun to design and implement all of this. However, Dmitry and Mikhail, our auditors, identified that all of this was not needed. Instead, when the time comes and we want to migrate to a new contract, we can write an “exchange contract”. To migrate, a user would approve() their tokens to the exchange contract, and call a method on the exchange contract. The exchange contract will try to transferFrom() tokens from the user and if it succeeds, it will tell the new token contract to create tokens for that user. Much simpler, and much cleaner. So we decided to go with a Trustcoin that is a simple, easy to use, ERC20 contract. All the above considerations get their worth only if the contract is sufficiently secure. Aside from keeping it simple, we had multiple great engineers look at the code, and added tests to cover any dark areas. If you’re into Solidity, you’re more than welcome to take a look at our repo and review the contract. Imagine Alice approving an allowance of 100 ETH for Bob. After a while Alice decides to cut the allowance down to 50 ETH by calling approve(). If Bob sees Alice’s transaction before it gets mined, he can issue a transaction to transferFrom() 100 ETH from Alice and hope to get it mined before Alice’s transaction. If he’s successful, not only will he get 100 ETH (that would’ve been ok), but he would be able to follow that with another transferFrom of 50 ETH. We could not drop or alter the approve method, in order to support existing wallets, so we instead added another method called compareAndApprove (similar to MV & DK’s suggestions) that will only change one’s allowance to some newAllowance argument if another, oldAllowance argument, passed to it, matches the current allowance. Smarter, newer clients should use this method if possible to avoid the scenario described above. Actually, after reading Mikhail and Dmitry’s analysis, we decided to hire them to do our security audit. As mentioned above, they helped us significantly simplify the contract and we’re grateful for that. You can find the final security audit here. The smart contract for TRST is only the beginning of a journey for both the team and the community. It is a joint effort to build blockchain-based products that increase financial inclusion worldwide. Here’s to the financial empowerment of every community out there! Trustcoins: Why do we need them? How are they used? TRST) are used to compensate people for facilitating trust on the WeTrust network. TRST are used by users of our Trusted Lending Circle platform to pay fees to the foreperson organizing the ROSCA. A foreperson is undertaking some degree of risk in organizing a ROSCA, to his or her reputation, or to his or her finances (if the foreperson promises to cover any funds not received in a given ROSCA round). He or she may be the only one who knows all the members of the ROSCA. To compensate the foreperson for this risk, he or she can choose to receive a fee, in the form of TRST, from each pooled round of funds in the lending circle. These fees would be paid out in TRST, regardless of what the currency is being used in the Trusted Lending Circle (e.g., ETH, DGX, or another ERC20 token). Our platform will soon allow users to contribute using any ERC20 token, and the fees paid out to the foreperson will always be in the form of TRST, making them a vital and important part of our network. 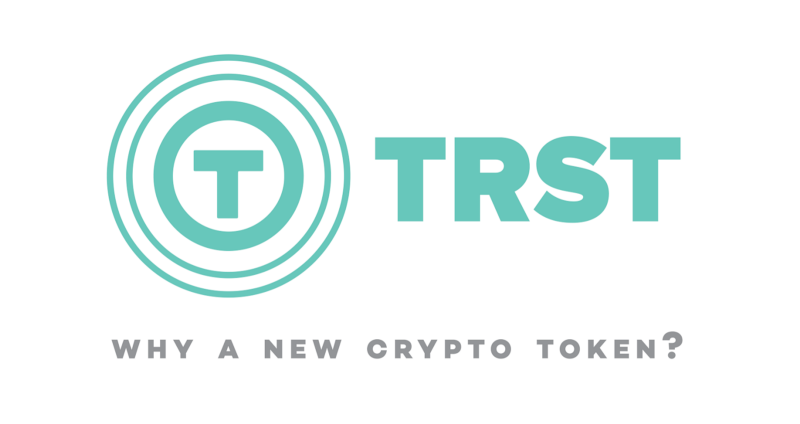 Moving beyond this simple example that has been implemented in our prototype on the Ethereum mainnet, there will be additional uses for TRST in our future products. As an example, say we have two people: a LENDER and a BORROWER. The BORROWER wants to borrow money, and the LENDER has extra cash she wants to lend. The LENDER and BORROWER are both fun, social people with a large network of friends, and they have a mutual friend, the LOAN GUARANTOR. This network of people who know each other is shown below. The BORROWER would like to receive a loan from the LENDER, but the LENDER doesn’t know and doesn’t trust the BORROWER, and won’t give the BORROWER a loan. Since the LOAN GUARANTOR knows both the BORROWER and the LENDER, the LOAN GUARANTOR can facilitate trust between these two strangers. Essentially, the LOAN GUARANTOR can vouch for the BORROWER to the LENDER. In return for providing this service to facilitate trust between these two strangers, the LOAN GUARANTOR will receive a fee to be paid out in TRST, as shown below. When it comes time for the BORROWER to pay back the loan, the BORROWER will make regular agreed upon payments to the LENDER. If for whatever unfortunate reason, the BORROWER cannot make further payments, then the LENDER will request those funds from the LOAN GUARANTOR (and the LOAN GUARANTOR will probably regret being friends with the untrustworthy BORROWER!). The case where the BORROWER makes regular payments, and the case where the LOAN GUARANTOR must make payments due to the BORROWER’s default, are both shown below. Since the LOAN GUARANTOR is taking on risk in setting up the BORROWER with the LENDER, the BORROWER pays TRST to the LOAN GUARANTOR for facilitating the loan and helping enable a lower interest rate than they would otherwise have paid when borrowing from an alternative lender. Once again, we see that the TRST token is facilitating trust on our network! an Engagement Manager at McKinsey & Co. in Switzerland. Hi Rafa, thanks for chatting with us! Could you tell us about your background, and how you started AhorroLibre? Sure! I’m originally from Tijuana, Mexico. I have a background in electrical engineering, and in 2005 I left for Switzerland to study an MBA. Afterwards, like many business school graduates, I decided to go into consulting to delay having to decide which industry to work in. I interviewed with McKinsey, and was lucky enough to receive a job offer from them. At first I thought I’d stay for 2 years, get to know different industries to better decide which to jump into, but then the 2008 financial crisis hit, and it was not a good time to jump careers. By my fourth year at I was already leading projects as an Engagement Manager and really enjoyed it so I stayed a total of 6 years. In my third year at McKinsey, I specialized in business development and new product launch strategy. As I was traveling all over the world as a business development specialist for the banking and insurance industry, I realized quickly that big companies were designing and selling products into emerging markets with little consideration for the differences between these and their own developed markets. Banking and insurance multinationals were creating products that only served the top ~20% socioeconomic range of the emerging market. I’m fortunate to be among this top 20% in Mexico, we lead a lifestyle similar to that of Europeans or Americans, consuming products from Fortune 100 companies. People at this level are the ones targeted when big banks say they “have an emerging market strategy”. And the bank’s products sell well within this top level, but the moment you want to scale it to over 20 or 30% penetration, they hit a wall. I’ve seen this happen time after time with clients’ products throughout many different countries. Big banks and insurance companies don’t have the cost structures, incentives, nor the mindset to produce and deliver comprehensible, useful and attractive products for the emerging middle class. I’m referring to the 3 billion people in the middle of the global economy, who have a good life expectancy, low child mortality, have formal (or informal) jobs, and earn an average weekly income $70–100. These people consume locally — in Mexico, most are paid weekly, because it is difficult for them to save. If salaries were paid monthly they would spend everthing 10 to 15 days into the month. The word “savings” has a different meaning for them, and their concept of insurance is completely different. “Time-value for money” or “interest” becomes irrelevant when you’re living week to week. Try and explain to them to put $10 away into a savings account, get the interest, and watch it grow, they’ll look at you and say: “I need those $10 more basic immediate stuff like, rent, and feeding my kids. How do you expect me to save for my ‘kids college in 10 years’, when I can’t pay for the antibiotics he needs now?”. Think about it, what would you do if $50 for antibiotics was half your weekly salary?. If you try to come in with developed world products, designed with a first world financial mentality, you hit this wall. The reason for this famous financial inclusion gap is that the financial products that are trying to fill it are speaking a totally different economic language. People talk about financial education for the emerging middle class, but I see it differently. I think the western world, and those of us educated in the western mindset, need to go through the process of educating ourselves on the emerging middle class’ financial needs and viewpoints. During the process of doing business development for Fortune 100 companies across various emerging markets, I became intrigued by fintech and how it was beginning to appear on the startup scene. The huge growth in penetration of smartphones that I was seeing first hand, this helped me realize that fintech would be the solution for the financial inclusion gap. Big finance has been trying to close the gap for decades, but given their cost structures it seems an uphill battle. It’s not in their interest to transact 100 pesos (that’s about $5), or to maintain and service a savings account with a $15 balance. It became clear to me that fintech would be the way forward. I wanted develop a business model to serve the emerging middle class with low-cost financial services through fintech, but I didn’t’ know how or where to start. In order to get a sense of what was happening on the ground I started taking unpaid leave from consulting and spending a few months each year in Mexico, in 2010 and ’11. As a consultant, my first instinct was to do a market study, send out questionnaires, and so forth. I ended up deciding not to do that, since in my consulting work I had seen market research biases in action. Instead, I decided to go undercover. I dressed down, and for 8 months, I walked into “los cañones”, the middle and lower-middle class areas of Tijuana. “Los cañones” translates as “the canyons”, these are hillsides where people arriving to Tijuana squat and build their homes and communities. The city doesn’t have a chance to map these areas out so at first there are no basic services, like roads, water and electricity, over time the city catches up and after 5–10 years they become middle new middle income areas. I walked in, and told people: “I just moved to Tijuana from the south, and I’m looking for savings.” People directed me to the cundinera or the tandera — people organizing these tandas or ROSCAs, mostly women between 40 and 60, but also some younger men between 30 and 50. I started participating in these groups, coming around each period to make my payments, speaking the cundinera, becoming friends with her. She would show me her book, (the one handed down to her by her mother), and explain how she runs the savings groups. I would meet the people paying into the funds, grab a taco and beer with them. I’d understand their situation and why they save this way. In addition to ROSCAs, there’s also a concept of an ASCA — an Accumulating Savings and Credit Association — also known as caja de ahorro, for savings and providing direct loans. I participated in all of these, and connected with the people participating. I learned how these organizations operate, why people choose to participate, how they mitigated risk. I educated myself in their reality, as opposed to theoretically trying to gauge it. That’s when I had the idea for AhorroLibre, and for what would be our first product — I began to focus on the idea of “relevant, practical services they are familiar with.” With AhorroLibre, I wanted to create a smartphone enabled version of a ROSCA, so people would have access to a financial product they understand. When you approached the tandera to join the ROSCA, you were a stranger to them. How did they come to trust you enough to participate in their ROSCA? Did they have a system in place to discourage bad actors? They have a full set of risk mitigation procedures and selection criteria. The tandera may or may not charge a commision for managing the fund, but she would definitely ask me “Who sent you?”, and I would say so-and-so that I met. At that point, she still doesn’t know or trust me, but she would allow me to join the group only with the last number. Being the last number means I’m forced to be the last person to cash out — and as a result, the group runs no risk. It’s a whole process, as I build up trust, I can improve my number. And the tandera doesn’t have this procedure written down, it’s just something she does. She would say “This is how my mother did it.” But it’s practical, and it works. She had no idea what she had was a full fledged risk evaluation and mitigation process. Did the people you interacted with have any access to more traditional forms of banking at all? The have ways to save and mitigate risk in their world of “informal finance,” but they have limited access to formal finance by way of banks with specialized ways to lend them money. The middle income banks that do lend to them have their roots in the microfinance business model, using the same social peer pressure structure. If you need to replace your car’s transmission, you go to a mechanic, who charges 5000 pesos — $270 — cash only, but you only make 1500 pesos a week!. So you first would try to build a ROSCA group. If you can’t find people you trust, then you would go to these banks that are official lenders. The banks will say yes, but come back with 5 or 6 people from your friends or family, and everyone can sign a group loan, and you will be responsible for everyone else’s payments!. Everyone gets their money up front, exactly like microfinance but for the global middle income. The loans are not guaranteed, and due to moral hazards and adverse selection, as a result these banks can charge 70% to 150% APR, making these loans highly unpayable and perpetuating a vicious cycle. These formal middle income banks mostly came out of retail stores that sell electronics and appliances, and would provide loans to purchase those products. Eventually, they realized they would make more money from the financing than the actual product sale, and they evolved into full fledged banks providing microfinance-type group loans. Even with these middle income banks, the clerks would hand them the term sheets, and mention that they’d be paying interest, making payments of X each week, and if they miss a payment a penalty of Y, but most people have no clue what that meant. They just desperately need the 5000 pesos, they sign, get the money and go solve their immediate need, then worry about how to make the payment later. That’s how much they understand these problems. However, if you tell them, “I’m doing a tanda of 100 pesos, 11 numbers,” they immediately know what you’re talking about. They know all the do’s and don’ts, what payments are available, and so on. It’s a product they understand, as it’s part of their culture. I realized the importance of providing services they know and understand. The first product we made on the app was a tanda, because we were starting with something built from their same financial DNA. Since then, I’ve piloted a caja de ahorro, and recently piloted a money pooling feature for for community purchases (a local community bought and built a children’s playground). Over time, I want to use the tanda as a basis for offering other products on top of it. As users mature at their own pace, and move up the financial product ladder, it will open up future products. You know, when I look at a ROSCA, and I analyze it, it’s actually the most complex retail finance product I can think of. Note that I said retail finance, on Wall Street they certainly have more complex products. So to me, it’s not about teaching the emerging middle class more complex products, but about bringing their existing financial DNA into the digital world. That way, it will be easier for them to understand, more transparent — and now it can be more efficient and more scalable since it’s available on their phone. After that, I will start separating out the components, into something that’s just a loan, or just savings. Do you think users of products like AhorroLibre will evolve to begin using the products of traditional banking? Instead of saying “evolve”, I would use the term “moving down” to simpler products. As I mentioned, the ROSCA to me, is the most complex retail financial product. I do see people eventually moving down from ROSCA to simpler products, because it can be an easier way to get the money if all you’re looking for is a loan, or you’re only looking for savings. From 2015 to 2016, AhorroLibre was prototyping a web app, and in January of this year our app became available. In the past years the emerging middle class has leapfrogged from having no Internet access to having smartphones, without going through the growing pains of desktops and laptops. They are very comfortable using smartphones, and don’t even use the web browser much, most of their consumption is directly app based. We did extensive testing with our web app just to understand the product, and now it’s available as an app in the Google Play store in Mexico. At this point, I would actually like to see more companies in Latin America offering tandas / ROSCAs online, there are few apps out there but they seem more like theoretical exercises, and none of them are actually proving the full tanda service (group creation, administration and movement of funds). Billions are being transacted in face-to-face cash based tandas, but these tandas are insecure and not very transparent. In the future, when people create digital tandas, I would like to see it be as easy as inviting friends to a WhatsApp group chat. At the same time, for simpler products like direct loans, I would like to see people say “just ask AhorroLibre”, and then we can funnel loans from the lending company, since they have a good history of making tanda payments. Instead of going to these emerging middle class lending banks, which said “Come back with 6 people”, they can just click the AhorroLibre app, see what kind of loan they’re approved for, and get maybe a 30% APR instead of 80%. Once the emerging middle class users of your app reach a point where $200 is no longer a financial burden requiring lending, do you think they will still use ROSCAs? Definitely, people will move down the ladder of complexity to use other scalable financial products (traditional loans, savings, insurance). But I don’t think they will stop using ROSCAs and tandas, instead those other products will be an addition to the ROSCAs. That’s because ROSCAs have a very important component of social support. Many people participate to help a brother or a cousin out. In helping them, they get savings too, and get to know they are helping their family. I don’t think these things will go away, they will just become more formalized, easier to manage, and become one of the multiple products they will use. I think another interesting question is, will the banks move into this arena? And I don’t think they can. I think the banks will buy the fintech startups doing this. Say they buy AhorroLibre when we have reached a million users — it’s in their best interest to maintain the brand and the app. They will now have payment information, provided through the app on their loans, and they will have a way to place loans in a cheap way, without using something like Salesforce. Their cost of loan origination will be next to zero. So banks can move into this space by acquiring fintechs that are focusing on this market. Banks won’t be able to change this, it’s not in their DNA — the DNA of the emerging middle class is like a different species from that of the finance world. Only startups can flip this paradigm — startups built in the developing world with a developing world mindset. What are the challenges for a developing world start-up like AhorroLibre? We aren’t based in Silicon Valley, we’re based in Mexico, and we can’t pay Silicon Valley salaries. We can only pay a fraction of a Silicon Valley start-up salary. It’s hard for us to find and attract people to build more complex things like an Ethereum powered backend which can help reduce the friction involved with running a digitized ROSCA. Instead we have to find and develop our talent in-house, which takes much longer, we’ve been doing this for 5 years already. With those realities, we’re striving to build products that are relevant and useful to people in the emerging middle class. However, as more companies see the opportunity to serve the middle 60%, we see greater opportunities to collaborate and reach a brighter and more financially inclusive future, sooner. Thanks for sharing your exciting and inspirational story, Rafa! Together we’ve raised 80,092 ETH &1,048 BTC, and the entire team is both grateful and humbled by the opportunity you’ve provided us. Thank you to all1,791 participants for your support of WeTrust. The WeTrust Team vows to work tirelessly to advance the mission we’ve set out a few months ago. Our immediate next step is to distribute the Trustcoins in a safe and efficient manner. If you haven’t already done so, please provide us with a receiving address in by logging in to your dashboard. It’s important that this address is from an ERC20-compliant wallet, and specifically not fromCoinbase, Kraken, or other exchanges. We will have multiple distributions to ensure all participants have a fair chance to provide their receiving addresses. There is no rush because we’re going to continue with repeated distributions over the next 6 months; however, distributions will occur in lower frequencies as time goes on. That being said, if you’d like your TRST in the first distribution tranche, please provide your address by Saturday, April 15th, 2017 23:59:59 UTC. In case you entered a wrong address(e.g. from exchange) and you’d like to skip this distribution and join a future one, please use the “Clear” button to delete your address before the time mentioned above. Our first priority after the crowdsale is the distribution and asking our escrowsto validate the results. After distributions are validated by escrows, Finclusion Labs will receive the Bitcoins and Ether contributed to our crowdsale. We plan to convert a good portion of the collected cryptocurrencies to USD after funds are released by escrow because a vast majority of our expenses will be in USD. For the next step in terms of our development, we plan to revamp the UX of the Trusted Lending Circle dApp. Of course, please stay tuned for our next newsletter update! MEW is one choice for a wallet, there are many others out there. It is the user’s responsibility to perform the required research and choose the best ERC20-compliant wallet for them. WeTrust does not have the resources to verify the security and functionality of the third-party MEW application and cannot take any responsibility for damages caused by using it. THIS IS NOT THE USUAL YADA YADA: during this process you’ll be learn how to use MEW to send transactions. We cannot stress enough the importance of entering the correct destination address — if you enter the wrong address, you’ll lose access to your tokens. There is simply no recourse for this scenario. Therefore, it’s important that you do a small test send to ensure you have entered everything correctly. 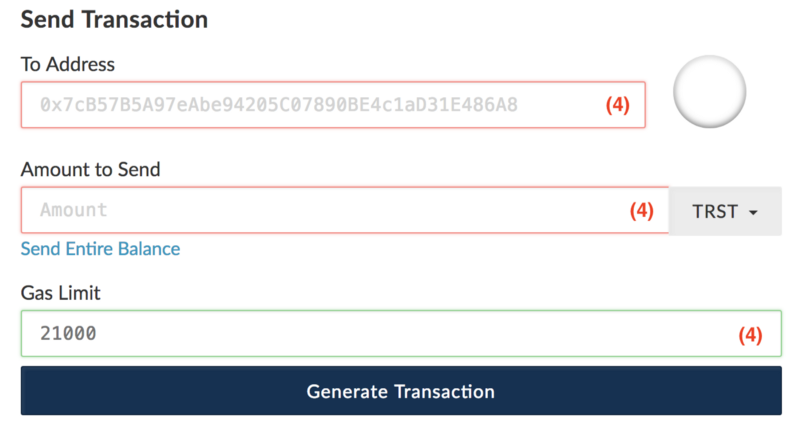 To begin the transaction send set up, please visit: https://www.myetherwallet.com/. Please make sure the address is correct and there is a ‘green lock’ next to the address indicating the website is secure. In order to restore your wallet, select ‘Send Ether & Tokens’. In this example, we will use our Keystore File (1) to restore our wallet. MEW will prompt you to ‘Select Wallet File…’ (2). Please select the file that was generated when you created your address. Since the file is encrypted, you will be required to enter the password to unlock the private keys. Once you’ve finished entering your password, click ‘Unlock’ (3). 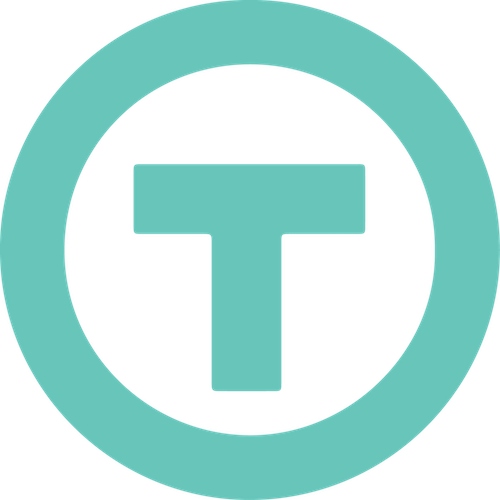 The ‘Token Symbol’ is: TRST. Upon entering these details, the number of Trustcoin (TRST) should appear in your MyEtherWallet. Next, in order to send the transaction, you will need to enter in: your destination address in the ‘To Address’ field and the ‘Amount to Send’ (4). It is IMPORTANT that this is correct and there are no typos. Failure to enter the correct address and send amount will result in lost funds. Transactions are irreversible. The ‘Gas Limit’ (4) will auto-populate, but you will need to have at least 55,000 gas to have the transaction go through. Please keep in mind you will need to have some ETH in your wallet to be able to send your TRST as there is a small gas fee. A warning message will appear and this will be the final confirmation before your transaction is sent. Make sure you confirm the ‘Amount to Send’ and the ‘To Address’ prior to making the transaction. Congratulations, you transaction has been sent. Once your transaction has been mined, your recipient should see their funds. Due to varying speeds of the Blockchain, transaction speed can vary day to day. It usually shouldn’t take more than a few minutes. Thanks to WeTrust Editorial Team. blockchain startup Stampery, and created the world’s first Linux distribution with facelogin. Hi Luis, thanks for chatting with us! Tell us a bit about your background, and how you started Aragon? I started writing software when I was 12 years old. Back then, I created a simple Linux distro with features like facelogin, and in the process I fell in love with free software. I created a couple of startups when I was 15, and when I was 16 I discovered Bitcoin, and the first thing that came to mind was “this is not possible!” A couple years later, I read the whitepaper, and was blown away. After a couple years growing a Bitcoin startup, I saw that Ethereum was gaining traction, and realized the world needed a way to organize companies on the Ethereum blockchain. That’s when I started Aragon. Will Aragon have a token? Yes, we will have a token. Aragon will work for free for anyone in the world without requiring a token. Those Aragon companies can provide services and make decentralized orgs mainstream. It will make it easy for people to create decentralized organizations, to invest and work with them. Within this network of Aragon companies, we will provide upgradeability, a decentralized court system for arbitration, and a lot of services that can only be provided at scale. Using the Aragon network token will be a way to bring governance to the whole network. It will also be a price for Aragon companies to subscribe to the network. Since we first created the product without any kind of token sale, that’s been a common question lately. We wanted to get the product out there and see in which ways a token model can improve it. We figured out that to make decentralized organizations widespread, there are a couple hurdles to overcome. The first one is making organizations upgradeable, so they can last for the next couple of decades. The second one is providing a way to resolve human disputes that smart contracts don’t cover nor understand. After a lot of imagination, we came to a conclusion. What if there was some kind of virtual jurisdiction that Aragon organizations can run on top of? We call it the Aragon Network. It provides Aragon organizations with services that can only be provided at network scale. Such as automatic upgrades or a decentralized court. The token will give holders the ability to govern the Aragon Network and pay for its services. You can read more about it here. We just announced the token sale this week. It will begin the 17th of May, and last a whole month. 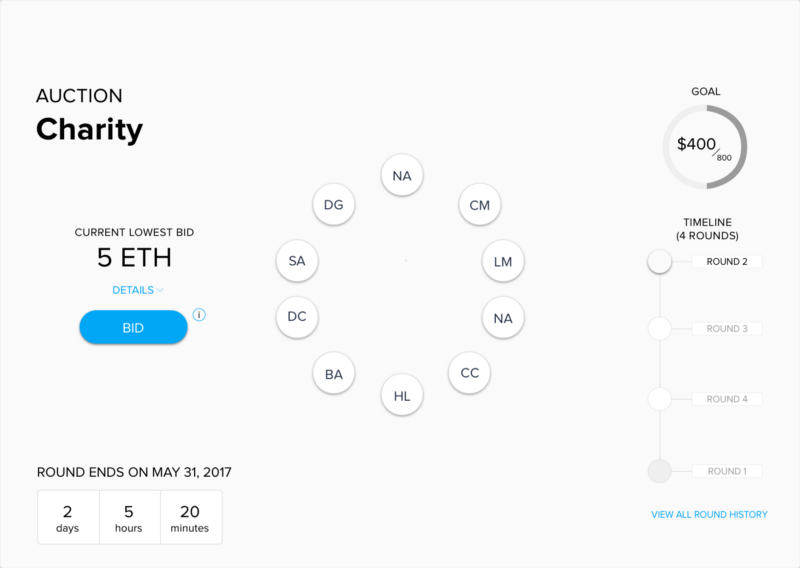 We were heavily inspired by Ethereum’s token sale, and tried to architect it as similar as possible, while adding some new features such as vesting for founders and early contributors. We think vesting is a must for token sales. How does the decentralized court concept work? In our mind, it works at 3 different levels. The network will assign 5 random judges, all bonded to the network. The judging will work as a prediction market, in which judges bet on which party is right or wrong. 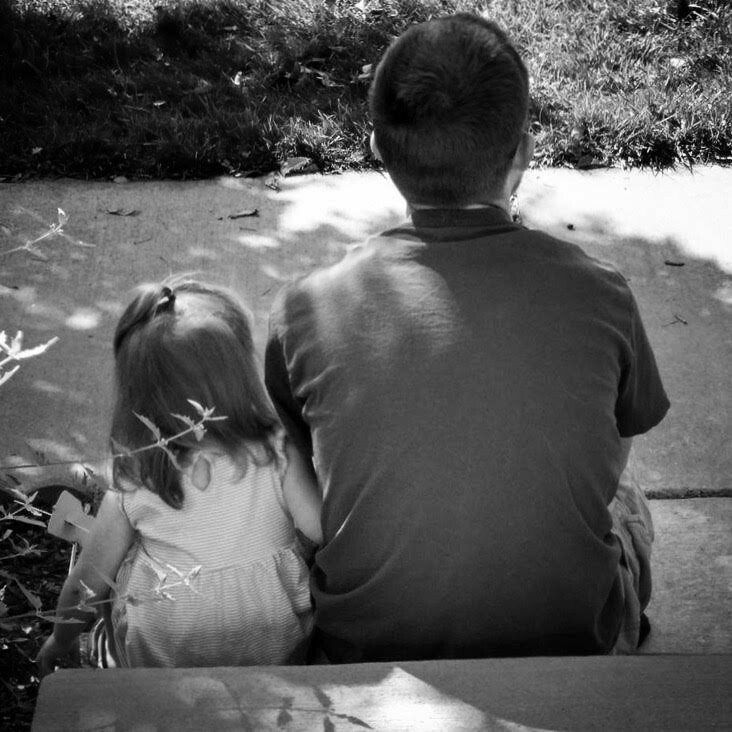 If they judge incorrectly, the bond will be taken away. When somebody opens a lawsuit, they will post a bond, and if they don’t agree with the judges decision, they can increase their bond, to make their case public to a whole network of judges who act like another prediction marketplace. If you don’t agree with that decision, you can increase the bond further and go to the Supreme Court, the top 9 judges by reputation. The judges’ reputation will be earned through the accuracy of their “predictions” in other lawsuits. 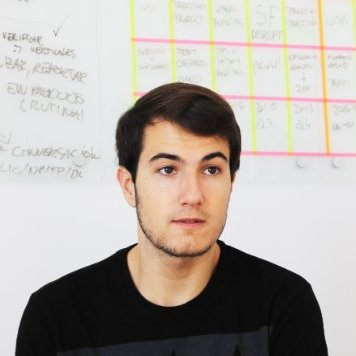 We’re trying to see which other services can be leveraged for Aragon companies. Other projects are building decentralized courts, and we don’t want to reinvent the wheel, so we are in touch with that projects in the space we can partner with. I saw that Aragon has a major focus on making its product accessible to a non-technical audience. Can you describe some of these features? We have created our own desktop client, so you don’t have to run a full node or download any browser extension. I’m a perfectionist, so I’m always trying to make user experience pixel-perfect. This whole ecosystem must make it even easier for our users. I think a big problem is the complete lack of information and user friendly documentation, and this is something the entire community needs to improve. For people like my mom, if you don’t present clear documentation with pictures and drawings they don’t get it. But this is progressing, Ethereum moves fast. For example, 4 years ago, there wasn’t even good developer documentation about Bitcoin! Do you have any thoughts on the WeTrust project? I know you guys launched a few months ago. You’re trying to make something that is easy to use, and I like that. It’s easy to explain your concept to people. That has to be the number one priority. When people read your website, even if they’re not a technical Ethereum person, they know you can make trusted lending circles, and all they have to know is that there’s something called blockchain that makes it possible. It uses the blockchain, but is not centered on it. Thanks for chatting with us and for the kind words, Luis! Hi Grant, could you tell us a bit about your background? I’m a Partner at Goodwin Proctor in our Silicon Valley office, focusing on securities litigation and white collar defense. I am also Chair of the Digital Currency and Blockchain practices at Goodwin Proctor. I was formerly an Asssitant US Attorney, a role where I prosecuted white collar and drug cases. I am also a Founding Member and Board Member of the Digital Currency and Defense Ledger Coalition. How would you rate the US legal system’s acceptance of cryptocurrency projects? The US legal system has made it costly to be innovative in this space, and is not particularly sympathetic to startups. That being said, government and regulators are light years ahead of where they were 2 to 3 years ago, are trying to be more crypto-friendly, and are trying to understand cryptocurrencies more. However, there’s still a lot of uncertainty and concerns about the impact to consumers, as we saw with the recent rejection of the Bitcoin ETF. What are your thoughts on cryptocurrencies and the Blockchain space? I think cryptocurrencies and blockchain are a fascinating space. I first got involved 3 to 4 years ago, when the state of things were was still in semi-anarchy, and I watched the transformation of it. One of the reasons it’s been interesting to me is the tremendous amount of highly intelligent, motivated,and free thinking people working in the space. Back when I started there was a belief, and there still is a belief, that this is a transformative technology. Cryptocurrencies are extraordinarily global and breaking down borders, and we’re already seeing a shift from the original focus on digital currencies to a focus on technology. The digital currency aspect is here to stay, but the technology is morphing into fantastic and different applciations.. We’re just in the beginning stages of figuring out applications of that. What are the major legal roadblocks to greater acceptance of cryptocurrencies in the US? One of the big things is, you need more mainstream adoption. One of the reasons government is much more open to cryptocurrencies and blockchain compared to two years ago is because consumers and businesses are demanding it. It’s like Uber, which encountered a whole host of legal trouble and fights, but also eventually had regulatory adoption because so many consumers want that type of product. Cryptocurrencies are not mainstream yet, but as they make gains and as blockchain becomes more mainstream, regulators will have to adapt. The other concerns are about visibility, primarily the government’s fear that blockchain will be used where they don’t have visibility. Like anything else, such as the Internet and banks, the blockchain raises concerns of criminal activity. There’s some confusing regulatory oversight, with regulators like the FCC, SEC, FinCEN, CFTC, and state regulators all in the space. With the recent explosion of businesses using blockchain in appropriate manners, the government has become less concerned about criminal activity. I’m seeing a lot of really great uses of this technology, which is helping a lot, and I hope to see more great uses. Thanks for chatting with us, Grant! Recently, WeTrust Front End DeveloperTom Nash attended the Auckland Blockchain Conference, an event aimed at helping people understand how the blockchain and smart contracts are going to change and disrupt every business sector from agriculture to finance. 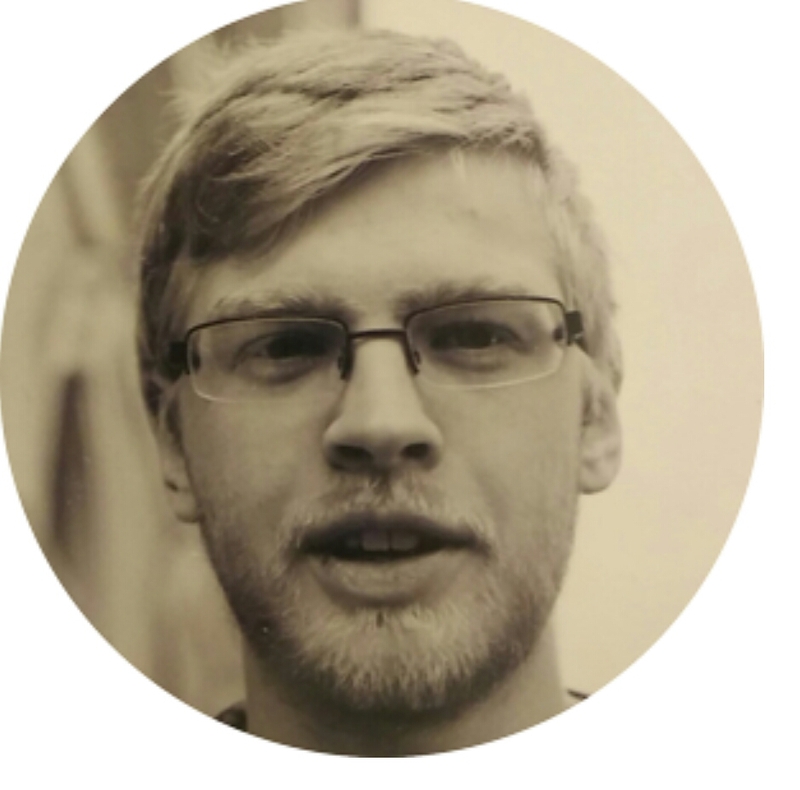 He talked blockchain andand WeTrust, networked with folks doing some pretty groundbreaking work with the blockchain, and learned a lot of new ideas that he shared with the WeTrust team. Those ideas have led to a lot of interesting discussions around the WeTrust office as we work hard on creating the best product possible. Here, Tom shares a brief summary of his experience at the conference. For the last six months, one topic has consumed most of my time. Over the last couple of days, I had the opportunity to find out how this topic affects a wide variety of industries. Spanning two days with over 25 presentations, the blockchain conference in Auckland, New Zealand, saw the fundamentals of blockchain explained, explored and subsequently applied to business models ranging from agricultural supply chains to hotel bookings. Day 1 consisted of a pretty quick rundown of blockchain: what it provides, broad principles of how it works, and warnings to anyone who thinks they can ignore it. Mark Pascall (BlockchainLabs) explained how to tell your friends about blockchain without their eyes glazing over, Pamela Morgan (Third Key Solutions) warned tech-averse lawyers that blockchain was about to consume their practices unless they provided services outside of being an intermediary, and Andreas Antonopoulos gleefully skewered centralised institutions who have — until now — been able to tell us what money is and how we can use it. Day 2 started off with a deep dive into how blockchain-based solutions are already shaping business models. Christoph Jentzsch (slock.it) explained the thinking behind TheDAO and how DAOs are not just possible, but almost trivial using blockchain tech (as long as you don’t write bugs); Margaux Avedisian (Transform PR) schooled us all on how to raise money through a Token Crowdsale; WebJet talked of their work with Microsoft to blockchain-ify their bookings platform over the last year using a private Ethereum-based chain; Emma Weston (Agridigital) detailed how blockchain is already playing a role in agricultural supply chains (with Agridigital firmly spearheading the charge); and Kaidi Ruusalepp gave a rundown of her venture Funderbeam’s blockchain-based stock trading platform, particularly noting how around 80% of stock trading middlemen could be cut out with a switch to such a platform. After seeing blockchain successfully applied to massive industries, we were taken on a journey into a possible future. Max Kaye (Flux) briskly whacked the current political system around the head and gave a well thought out, technologically infused alternative. Max systematically dissected the flaws in the current methods of vote counting, whereby the vote of a specialist on any specific topic is worth the same as that of a layman, after which he proposed a solution utilising ‘weighted votes’. I’m simplifying his thorough explanations massively, so definitely check outhttps://voteflux.org/. Peter Borah (Ownage) put the pro-blockchain narrative hard into reverse and gave us an overview of why blockchain performance is lacking right now, why a worldwide computer can only process around 14 transactions per second, and the solutions currently in the works to bring higher performance blockchains to the fore. Projects presented included sharding (fewer initial validators per transaction), state channels (doing a heap of transactions off-chain and then uploading the results), and TrueBit (cheaply gamifying the verification of complex computations). Peter kept our expectations in check and firmly stated that performance enhancements are crucial if the groundbreaking principles of blockchain tech are ever to gain a true foothold and bring real change to the greater public. Finally, we were treated to the main man himself, nerd-jesus Vitalik Buterin, who crafted a great ground-up explanation of how cryptoeconomics — a field of which the first viral application was Bitcoin — can be leveraged to provide a self-facilitating system of borderless trust. Vitalik went on to explain how these principles can be applied to many different areas where economic theory alone often fails to provide a scalable solution, but the universally-binding laws of cryptography can give answers. 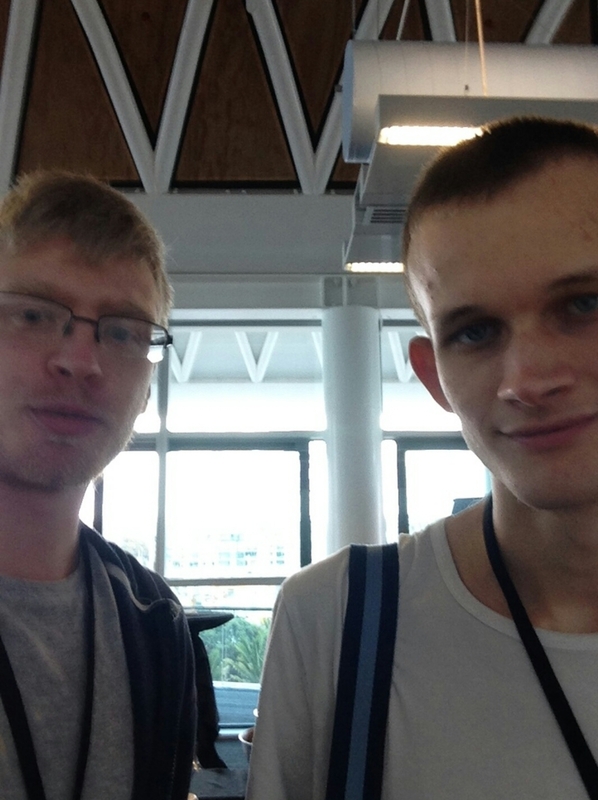 I managed to grab a few words with Vitalik to ask him about a problem I’m facing with a project. He thought for a little while before telling me the most straightforward solution would be to make my own blockchain with a modified proof-of-work algorithm. Easy, thanks Vitalik! Again, I’ve massively simplified all the presentations here and omitted a fair few of them for brevity’s sake. If you would like to watch them for yourselves (I thoroughly recommend doing so), the videos will be released after they’ve been through the editing mill in the next few weeks. I came home with a massive reading list even though I was very picky with my notes, so I expect to have my head in books and academic papers for the next few months. 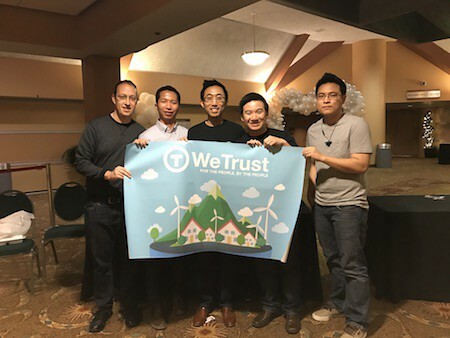 A lot of ideas shared at the conference could potentially be leveraged to make WeTrust the best product possible, and I’ve shared these ideas with the team and had great discussions about their applicability. It was a pleasure to meet so many others who share a fundamentally similar worldview, I’ve made real connections with intriguing folks over just a few hours of interactions, and come away with a resolve to keep in touch with many of them. We are currently deliberating between these two high potential options, which we describe in more detail below. We would like to hear your opinion and incorporate your feedback into our decision making process regarding our next product. We believe our community makes our project stronger, more meaningful, and we’ve taken to heart your requests for more sharing and information on our progress. We are trying to strike the right balance regarding frequency of communication, and in the future you can expect to hear regular updates as we progress on the Trusted Lending Circle dApp revamp and our next product. We plan to have the designs complete by the end of May, after which we will be implementing the changes. Our goal is to make the Trusted Lending Circle DApp much more attractive and easier for the average person to use, and we expect to complete the revamp by the end of June. We’ll be simplifying the process of creating and participating in a Trusted Lending Circle, so that new users will be excited to use the WeTrust app with their friends and family, and won’t be deterred by previously-dense, spreadsheet-style pages filled with numbers. On a related note, we’ve received feedback from community members asking for the option of creating Circles with a “pre-determined” payout sequence (predominant in Tandas in Latin America and Chit Funds in India) and Circles with random selection of the winner. We will be rolling out these new features with the design revamp and here is the userflow that is currently being designed. These dependencies are critical for widespread adoption of Trusted Lending Circles, and we think the uncertainty in their development timelines should lead us to focus on endeavors that allow for iterative product releases and user feedback. We believe our immediate next product should allow us to progress toward our long term goals, have minimal dependencies on other projects, and allow us to add value independently to the Ethereum community while gaining valuable field-tested experience. Last week, we held in-depth discussions in San Jose, California with Rafa Jimenez, Founder and CEO of AhorroLibre, Latin America’s only digital Tanda (Trusted Lending Circle in Spanish) service. They are backed by Plug and Play and have served thousands of customers. We’re exploring a partnership with AhorroLibre and their partner bank, in order to jointly build an electronic-Peso token that has a 1–1 ratio with the Mexican Peso currency. This would enable access to banking accounts directly via a smartphone wallet, reduce the friction of transactions, and enable other financial innovation on the blockchain. 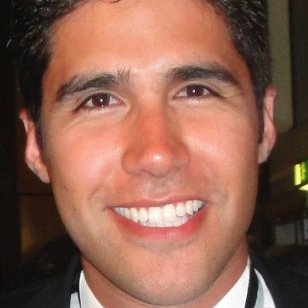 Rafa has significant experience with emerging markets globally through his experience at McKinsey, and has spent 4 years in Mexico building AhorroLibre and cultivating the banking relationships necessary to facilitate a crypto Peso stablecoin. As a next step, the WeTrust team plans to meet with the AhorroLibre team, users of the AhorroLibre app, and representatives of Mexican banks. In parallel, we have been evaluating and designing a trustless peer-to-peer lending product which enables borrowers to use ERC20 digital tokens as collateral for an ETH or USD denominated loan (the latter paid out via ETH, and in the future via stablecoins). Today, many people hold various ERC20 tokens because they believe these will either be useful in the future, or they will appreciate in value. However, huge amounts of tokens just “lie there” in wallets providing no value, even though they could serve as a basis for credit. This would be analogous to Securities Based Lending in the traditional financial system. ERC20 tokens (and other forms of tokenized assets, in the future) can become a new form of secure, low friction lending. The use of collateral serves as a safety net against default and eliminates the need to interact with a globally fragmented credit rating system. Borrowers can range from long term cryptocurrency holders, to startup founders who are “token rich”, but need access to funds for expenses. This service would appeal to a wide range of general debt investors and crypto investors who want to diversify their gains, due to the reduced default risk enabled by collateral held via smart contract. We’ve been working on the detailed mechanics and business use-cases of the product these past few weeks, and will have more to share regarding the detailed mechanics, in our next update. If we go the peer-to-peer lending route, we plan to open source the project in its entirety. Regardless of the path we take for our next product, we will consider a “buy & burn” mechanism of TRST tokens using any fees charged by the platform as a method to reduce token supply and benefit the entire WeTrust community. Our vision to bring fairer, cheaper and trustful financial opportunities to those who do not have access or want more from traditional financial systems underscores the importance of building a product that empowers people. Our proof of concept has demonstrated the viability of Trusted Lending Circles. However as we discussed previously, there are 3 dependencies that need to be addressed before this product can reach the unbanked and underbanked across the world. In the meantime, we believe we can deliver value to users while creating building blocks which we can leverage for future products. Which of the two products do you think we should pursue — and more importantly, why? Leave us comments here or on our slack channel! 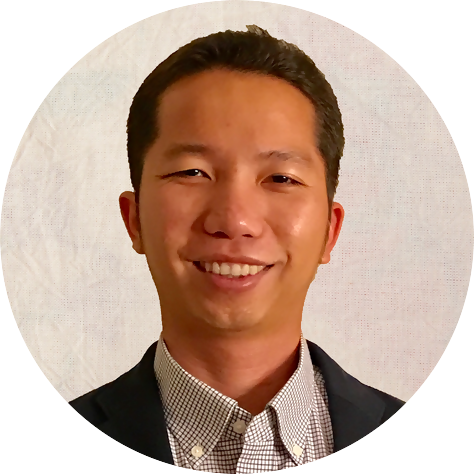 In our latest profile of the WeTrust team, we want to introduce you to Hoang Nguyen, WeTrust’s Vice President of R&D. Hoang was born in Saigon, Vietnam, and lived there until the age of 20, when his family immigrated to the San Francisco Bay Area for education purposes. Upon arriving in the US, Hoang attended 2 years of junior college, followed by an undergraduate degree in Civil Engineering with a minor in Computer Science from UC Berkeley. After his undergraduate studies, Hoang worked for a year at a small Bay Area start-up creating a new web service for the low income Vietnamese housing market, before returning to Berkeley to study for a Master’s degree in Systems Engineering. While completing his Master’s studies, Hoang worked on projects involving sensor networks and drones. After that, Hoang spent 2.5 years at PayPal, gaining deep experience in creating software to handle financial transactions. During a chance encounter at a mutual friend’s gathering in Silicon Valley, he met George and Patrick, who shared with him their idea of helping the underbanked. Hoang was immediately intrigued: he had been researching blockchain and was blown away by the potential of the technology. During his time at his previous start-up, he had already worked on products intended to help the poor. Now, at PayPal, he had developed software to make financial transactions easier. George and Patrick’s project seemed like a great way to combine his professional interests, and take them in an exciting new direction. There was also a more personal reason for Hoang to pursue the project: growing up in Vietnam, he had seen his mother participate in Trusted Lending Circles, known as hụi in Vietnamese. Access to capital in Vietnam is a huge issue, with large fees, high interest rates, and borrowers with no credit history creating an intractable problem. As a result, Hoang’s mother participated in a Trusted Lending Circle, with a group of friends to finance her tailoring business. Using the funds, she was able to buy fabrics and other raw materials for her business inventory. Once the business was successful, she continued to participate due to the social aspects: helping her friends with their capital needs make her feel that she was part of a close knit community. The use of hụi was so prevalent in Vietnam that one family friend, a doctor who operated a clinic out of his house, used the funds to stock up on prescriptions. Hoang mentions that the blockchain community in Vietnam is still nascent, but has started to gain traction. However, given the low fees that blockchain can provide, and the fact that there is so little existing financial infrastructure in place, he feels blockchain can provide an ideal solution in his native country. Given his experiences, Hoang holds very high hopes for blockchain in general, and WeTrust in particular. Hello WeTrust Community! We hope you’re enjoying your summer and have been staying cool. Here in Northern California where WeTrust is based, there’s been a scorching heat wave sweeping through the region. We’ve hit the ground running making improvements to our flagship Trusted Lending Circles product, partnering with blockchain industry leaders, and researching new products that will allow us to continue to lead in blockchain-enabled financial inclusion. Read on to learn more about what we’re working on. Most of our technical team has been focused on improving our Trusted Lending Circles product. We have brought on an additional contractor to help us build advanced TLC features, such as variable payout sizes and new methods for determining the recipient of funds. Other ways to determine the recipient of funds include lottery (where the recipient of funds is random each round), and pre-determined (where each person knows when they are receiving the payout). These types of payout methods are popular in different cultures, and we want to allow our product to reflect the needs of our users. We also met with Shaun Djie in person, Director of Business Development at Digix to see how soon we can use their DigixGold tokens in our Trusted Lending Circles product. Gold has been used as currency in ROSCAs throughout history and across cultures. Gold is particularly important in chit funds in India and Cundinas in Mexico due to its scarcity, price stability, and usefulness. At WeTrust we are committed to making our TLC’s accessible to everyone, regardless of geographic, and economic barriers. As a means towards achieving maximum accessibility, WeTrust will enable seamless onboarding of new users irrespective of local FIAT currencies. Integrating support for Digix’s ERC20 compliant token that is fully redeemable and reflects the value of gold, is one of many important steps we will take in this direction. As useful as our Trusted Lending Circles are for people throughout the world, WeTrust is on a continuous quest to be at the forefront of new technologies which enable decentralized community based financing to spread globally. The team is actively researching new products which leverage the existing Trusted Lending Circle infrastructure/platform/service in order to provide even more benefits for our community. We mentioned in our previous update that we are exploring two efforts. One of the products currently being developed by the WeTrust team involves leveraging cryptocurrencies as collateral on a fully decentralized peer-to-peer lending platform. One of the use cases for a platform like this is that it will give holders of cryptocurrencies and ERC20 protocol tokens the opportunity to earn interest on their coin holdings. We see this as extremely beneficial in cases where the platform for an app’s token is still being built, and the token has yet no function on the app. Users often hold these types of tokens long-term, and using our product they could gain liquidity without having to sell them outright. We have been actively conducting market research, meeting with academics who have researched this topic, as well as interviewing potential users. One of the drawbacks of creating such a platform is that the regulatory frameworks are almost nonexistent, and where laws do exist, they’re very difficult to interpret. We’re regularly meeting with our lawyers to find out how we can best fulfill this gap in the market, whilst complying with existing law. WeTrust needs to better understand existing regulation in order to build a great product, and subsequently enable others to have a clearer understanding of the current rules in which they can operate. A second product/experiment that we are working on involves enabling cryptocurrency token holders to form group “pools” of cryptocurrencies. We predict that by leveraging the wisdom of crowds, a group of people pooling their tokens together will see a more stable and consistent increase in the value of their cryptocurrencies compared to holding cryptocurrencies individually. This is a unique way to build upon the token pooling aspect of our existing Trusted Lending Circles product. The current iteration of the WeTrust website has reliably presented our mission to the world since before the launch our token crowdsale. It has been instrumental in driving interest and adoption of our first product, the Trusted Lending Circle. However, as we continue to grow and WeTrust’s product offerings continue to evolve, the current website is no longer sufficient to present all aspects of WeTrust to the world. Our new website will continue to highlight the Trusted Lending Circle, while also promoting our soon to be released products, such as the aforementioned Peer-to-Peer lending and group token pooling. We are working with the talented Hailey Tran on a beautiful new website design that will highlight all facets of the WeTrust product portfolio. Are you excited by the potential of blockchain? Want to work for a fast paced company tackling challenges at the forefront of technology and community finance? WeTrust is hiring! Our plans are gaining so much traction that we are ramping up our hiring incredibly fast. We’re currently looking for a Front-End Engineer, a UI/UX Designer and an Executive Assistant/ Operations Manager. We’ve already met with some candidates and expect to meet with many more in the coming weeks. If you or someone you know would be a good fit for our mission, please apply here!